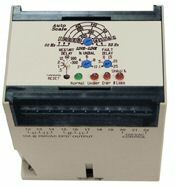 The ATC Diversified SLU 600 ASTDS Universal Phase Monitor protects againsts Phase Loss, Phase Reversal, Over/Under Voltage, Phase Unbalance, Over/Under Frequency, Phase Shift, and Rapid Cycling. The Line-to-Line voltage adjustment is set to the appropriate nominal voltage and frequency scale. When 120VAC control voltage is applied and normal operating voltage is present on all three phases in the proper sequence, the internal relay energizes and the Auto-Scale locks-in. Auto-scale will only re-activate by removal and re-application of control voltage. When an incorrect phase sequence phase loss, under voltage, over voltage, frequency shift, or unbalance energize (drop-out) after the fault Response Time has expired. When all conditions return to normal, the relay will energize when the adjustable Restart Delay has expired. Both Delta and Wye systems may be monitored with the ATC Diversified SLU600ASTDS monitor. In Wye systems, connections to neutral are not required. The SLU 600 ASTDS has DPDT, 10A @ 240VAC Resistive contact outputs. The SLU is UL listed.